In response to the drought devastating people in Horn of Africa, fifteen Wisconsin musicians have collaborated to release There’s a Drought, an album of original music. All proceeds will benefit drought and famine victims. Referred to as historic, the drought has surpassed famine thresholds in several regions of Somalia alone. It is impacting nearly 14 million people in the Horn of Africa which comprises Ethiopia, Djiboti, South Sudan, Somalia and Kenya. People are in crisis, traveling on foot in search of water, food and shelter, and often not surviving the harsh journey. Child deaths are alarmingly high, with 500,000 children at risk for imminent death. Antonio Guterres, United Nations High Commissioner for Refugees describes it as “The worst humanitarian situation in the world today.” A massive response is critical to avoid total livelihood/social collapse. "If people come together they can even mend a crack in the sky." "In an effort to not turn away, we wish to come together and provide a voice of compassion for the people in crisis, and aid for the unimaginable hardship," said Kim Albrecht, whose title track, "There’s a Drought," is the catalyst for the project. "With the purchase of this album people can join a local community helping to bring not only food and water into this desperate situation, but hope." There's a Drought includes brand new releases by 2011 WAMI nominee Nora Collins along with Mare Edstrom, Kenn Fox, and Sara Pace. The compilation showcases several firsts: "Rock River Waltz" by newly formed Midwest Guitar Trio, the title track by Kim Albrecht, and fresh-from-the-studio recordings from Jamie Jean, Garrett Waite and Tony Graziano. 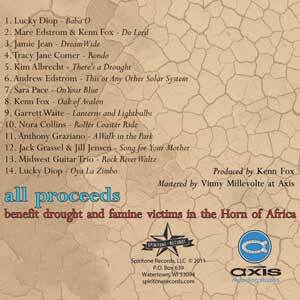 Planted between original arrangements of traditional African songs by Lucky Diop, this musical response includes tracks by Tracy Jane Comer, Andrew Edstrom and award winning guitarist Jack Grassel with Jill Jensen. CDs and T-shirts are available at several area businesses.